Civil Rights March on Washington, 1963. 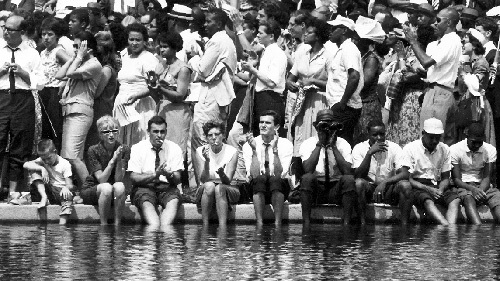 Detail from Marchers at the Reflecting Pool, 542032. Because they marched, the civil rights law was passed. Because they marched, the voting rights law was signed. Because they marched, doors of opportunity and education swung open so their daughters and sons could finally imagine a life for themselves beyond washing somebody else's laundry or shining somebody else's shoes. The National Archives has an extensive collection of images and video from that day. The shot above is taken from one of them.